John Piper’s preaching and publications have constructively influenced countless Christians. If you were wondering who has most influenced John Piper (after Jesus Christ), we now know for certain—it is the apostle Paul (14). 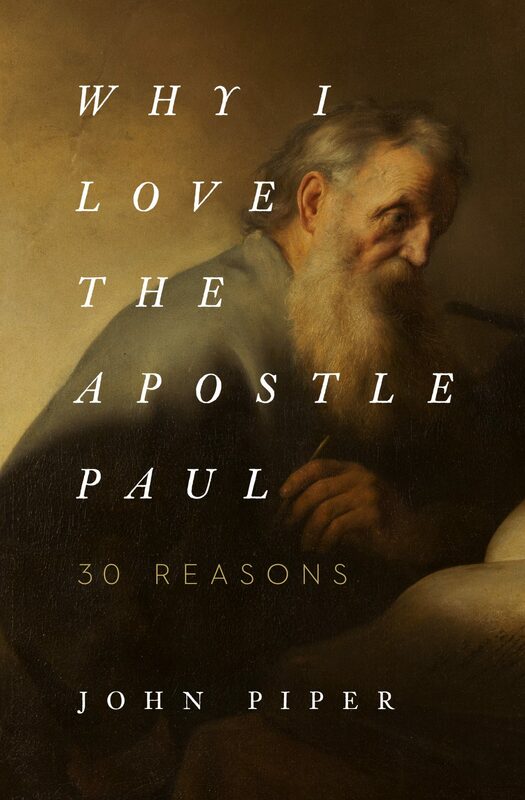 Why I Love the Apostle Paul: 30 Reasons is both a tribute to Paul and also a testimony to the ways the apostle has shaped Piper’s thinking, priorities, and life. This slim book, by design, is “not anything like a comprehensive overview of Paul’s thought”; instead it is “highly personal, and even idiosyncratic” (14). Piper explains why Paul’s writings, ministry, and life have won his “admiration and affection and appreciation” (14). He writes with an expressly apologetic aim—“I believe that the reasons I love him, taken together, are a compelling case that he is not a liar or a lunatic. I want you to be deeply and joyfully persuaded that he is admirable and trustworthy and that what he writes is true” (15). Crossway (2019). 208 pp. $14.99. John Piper, a best-selling author and popular pastor who has preached to thousands around the world, claims no person other than Jesus Christ himself has had a greater impact on his life than the apostle Paul. In this book, Piper reflects on the ministry of this famous persecutor-turned-missionary, drawing on the six decades he has spent “getting to know” Paul through the New Testament, which records his conversion, missionary journeys, and 13 letters he penned to churches throughout the ancient world. There is overlap and even repetition among the sections, but their cumulative effect is to communicate the profound affection Piper has for Paul and to draw us into Piper’s delight. One virtue of this book is its careful exegesis of Paul’s writings. Whether Piper is showing us how his “Christian hedonism” was birthed from a study of Philippians 1:20–23, or how Romans 8:32 “changed the way I think about everything,” he helps readers to see the great spiritual dividends that a careful reading of Scripture yields (49, 191; cf. 45–51; 185–91). Piper also demonstrates that profound insights into the meaning of Paul’s teaching can be brief and clear. Some of the most moving meditations show how Paul’s writings have ministered to Piper in times of trial. Piper relates how 1 Thessalonians 5:9–10 served as a spiritual “helmet” during his prostate cancer diagnosis (71). He models how the promises in Paul’s writings can fortify the soul in the face of profound uncertainty and distress. He further relates how the apostle helped him to identify five “besetting sins” and take up the fight against them with “a kind of intentionality I had never exercised before” (74, 80). Piper concludes the meditation with a demonstration of “what [killing sin] looks like in practice” (80). Piper constantly emphasizes that the apostle Paul is not a man given to extremes. To the contrary, Paul’s thinking and life everywhere testify to the proportion and wholeness of a life transformed by Christ. Paul had a “towering intellect,” but he was a man equally possessed of “emotional maturity,” “willing to reveal . . . the depth and tenderness and intensity of his emotions” (85, 86). Paul is known for his tightly reasoned prose, but he was capable of scaling poetic heights in such passages as 1 Corinthians 13 (96). In both cases, Paul used his “outstanding logical and poetic gifts” in an effort “to help ordinary people love each other” (96). Paul was neither a pessimist nor an optimist—he was possessed of an “utter realism about human sinfulness,” even as he reflected a “spectacular vision of human splendor” in Christ (120). Paul was an apostle and conscious of his authority as an apostle, but passages such as Romans 16:5–16 show he was a “friendly giant,” a man who served and loved people (134). Paul’s demeanor with people was neither craven nor bullish. He was both blunt and “beautifully affirming” (139). The balance and proportion Piper exposes breaks down the caricature of Paul as aloof, censorious, and authoritarian. Piper recognizes that Why I Love is an intentionally fragmentary work. Even so, there are certain emphases in Paul’s writings that are either muted or absent. Paul everywhere understands the accomplishment of redemption in Christ to be the fulfillment of a long succession of promises administered to God’s people prior to the new covenant. He furthermore points believers to God’s moral law as the norm for human obedience (see Rom. 13:8–10; Eph. 6:1–3; Gal. 5:13–14). Paul was deeply concerned about the church’s government, particularly the qualifications and tasks of elders and deacons (see the Pastoral Epistles). Attention to such concerns would have yielded an even richer portrait of Paul than Why I Love paints. Readers will also need to judge for themselves whether Why I Love successfully realizes Piper’s apologetic aims. To be sure, Piper’s depiction is winning and compelling to the Christian heart. It effectively responds to the tired canards that circulate about Paul. Whether it establishes that Paul was “an authorized and truthful spokesman for the risen Lord, Jesus Christ,” however, is another question (13). Taken as a whole, Why I Love is a fitting homage to a master teacher by a seasoned and grateful student. Novice and expert alike will walk away from this book with deep impressions of the learning and devotion of Paul. And, if they have listened carefully to Piper, they will walk away with a profound sense of the love Paul had for his fellow believers—a love that is, of course, “the embodiment of the love of Christ” (195).